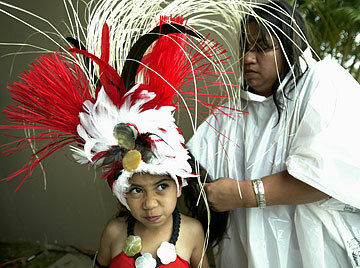 Seven-year-old Brooke Leslie received final preparations to her headdress from her mother, Gina, yesterday during the second day of the Fourth Annual Heiva I Honolulu Tahitian Dance Competition at the Waikiki Shell. Leslie, who has been dancing for seven months, advanced through her first round. The finals will be held tomorrow. Saronna Sigrah, 3, jumped around Wednesday in the HMSA Tumblebus, which came to visit Thomas Jefferson Elementary School. 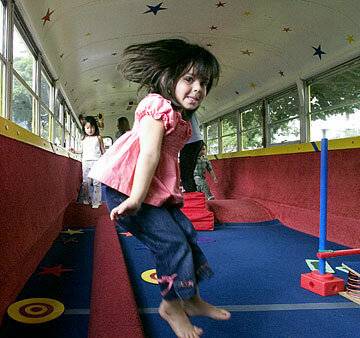 The Tumblebus is part of a program that visits Oahu schools to get preschoolers active and healthy.